Bike trailers, support vehicles…one bike or 200, we deliver your bike right to your door! Flat tire, no problem. We´ll have you riding again in no time! Our bicycle delivery services are available for individuals or groups who rent our bikes or who book one of our private Barcelona bike tours. You tell us where you want your bikes delivered – hotel, apartment, a friend´s house or a tourist site – and we´ll make sure your bikes are ready to go for your adventure. 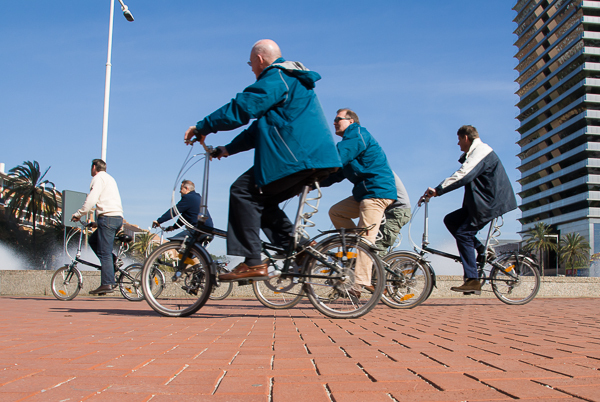 Whether you are a lonesome traveler or part of a group of 200 people, we can transport your bikes to the best starting and ending points for your group. No hassle. No traveling to our shop. Tell us where you want us to pickup your bikes, and we´ll be there ready to load up your bicycles. You don´t have to a do thing. Just tell us when and where. Depending upon your group size, we will provide you with a quote for our transport service. Take care of all the logistics. Transport, unload and arrange the bikes. Pick up and load the bikes at the agreed upon time and place. Your groups' bikes will be neatly arranged, tires filled with air and ready to go at the start of your tour. We will pickup the bike(s) at the agreed upon time and place. A good example of our bike transport service. Just walk out your door, get on your bike and ride! Private bike tours can go downhill fast because of something as simple as a flat tire. The only downhill we like is the easy cruise from the top of Montjuic to the bottom. That´s why we like to have one of our guides on call during every private tour. Should one of our normally-reliable bikes sustain a flat tire or other defect, our on-call rider will either fix your bike on the spot or give you a new bike so you can continue. We´ll have you back and riding in no time. Also, we limit our client-to-guide ratio to 15:1. Our emphasis on a manageable client to guide ratio means we can handle groups of two riders or 302 riders. No matter the size, we'll supply enough guides to maintain our 15:1 ratio. Small group sizes also give your friendly, English-speaking guide the ability to fluidly lead your group in and around Barcelona´s streets and plazas. 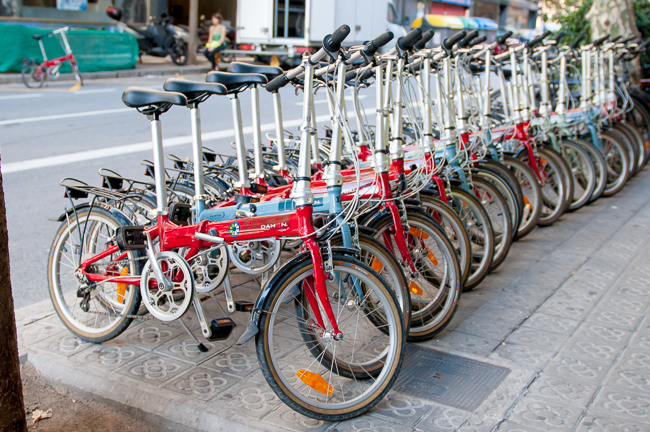 Small group sizes for our private Barcelona bike tours allow for a smooth experience.